Members of the Classical Society demonstrated ancient Greek and Roman battle tactics. 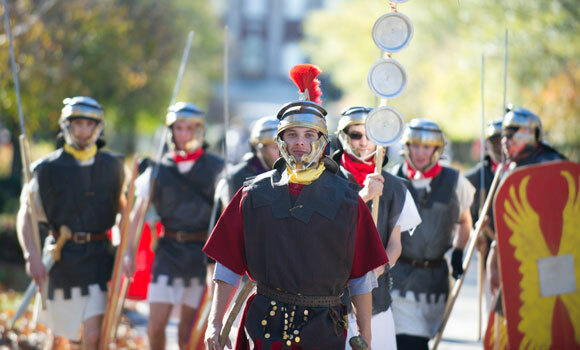 UNCG is a place where learning comes to life, and the Classical Society proved that by bringing a taste of ancient Greece and Rome to UNCG’s campus with its annual Classics Day. She said this year’s Classics Day was a success, and added that the Classical Society received excellent feedback from attendees. Hundreds of families, college students and high schoolers from around the state enjoyed a chariot race, a puppet show and military drills. They laughed along with a Roman comedy, tried their hands at gladiatorial combat (with wooden swords, of course) and played ancient games.